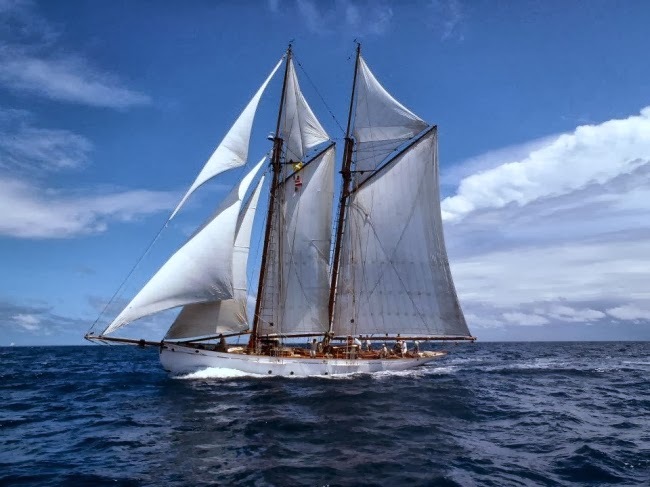 To celebrate the return of Coral of Cowes to the Caribbean we are dropping charter rates to $9,999 half board for 6 guests on all charters in the Grenadines during the months December, January and February (add 10% for Xmas / New Year). Coral and her crew are ready to charter and welcome you on board this wonderful classic sailing yacht for the experience of a lifetime. Coral was built in 1902 by White Brothers of Southhampton, designed by Fred Shepherd. Shepherd was known for his mastery of the use of space, and CORAL of Cowes is a fine example of his art. She had a refit in 2011 and her interior exhibits all the character of her original build as she has been lovingly and generously brought back to life; remaining, outside and in, a magnificent example of her genre - essentially quite unspoilt – and devastatingly beautiful to behold. Coral of Cowes accommodates up to 6 charter guests. The aft Master cabin has two single beds and is traditionally called the ladies cabin, but gentlemen are also allowed in there! Access to shower, toilet and washbasin is on the port side of Coral. The port amidships cabin has a double bed, washbasin, shower and toilet. The starboard amidships Guest cabin is traditionally called the captain's cabin which is alongside the companionway steps. However, the captain now has a berth with the rest of the crew in the forward section of Coral with their own bathroom facilities. A comfortable detachable berth can be added at 90 degrees to the permanent berth to make this a twin cabin with washbasin. Coral of Cowes also has an awesome bedouin tent style on deck shower - perfect after a dip in the warm blue waters!